If you’d like to reach us, feel free to give us a call, send us an email, or come stop by Houchen Bindery. We’re glad you came here where you can get in touch with us and we can help answer your questions. Make sure to check out our FAQs, where we may have already answered your question. If you’d like to reach us, feel free to give us a call, send us an email, or come stop by Houchen Bindery. How do I order from Houchen Bindery Ltd.? Ordering from Houchen Bindery can be as simple as a few clicks. We offer our online book builder for our On Demand Printing theses and manuscript customers, and order forms for all of our other binding services. After clicking “Order” from the top menu, browse through the guidelines, instructions and information about our specific services to learn about order preparations and how to order from Houchen Bindery. All order forms are found on the right side of the “Order” page. Download the appropriate form(s), complete and print them, then send them to us along with any materials required for binding (double check Order Instructions before sending materials). Can I get a quote for my project before ordering? Of course you can! Feel free to use our Quote forms for hard and soft cover books. If you’d like a quote for another one of our services, please contact us by phone, email, or through our contact forms. What needs to be done to my manuscript before sending it to print? Must be a PDF document. Only one PDF document will be accepted, up to 50mb in size. Must be ready to print, as is. We will not alter your document for you. All pages must be either 8″x11.5″ or 8″x5.5″, in either a landscape (wider) or portrait (taller) orientation. The document must be the same size and orientation as selected when ordering your book. DOUBLE-SIDED PRINTING: If wanting page numbers, the number must be included in the document if you want them printed in the book. We will not add them for you. We recommend having them centered. If you require a paper stock other than what we provide, please contact us. You can then either send us the paper stock for us to print on or send us the printed pages on the paper stock you want. If you have signature pages that need to be inserted within the book, please indicate that as a special instruction of the order. Can I have a logo on the cover? We do offer die stamping but not through our online store. Due to the cost of producing a die the price can double the amount of the order. If you require a die stamp please contact us for pricing. What cover colors do you offer? We have a variety of F grade buckram cloth cover colors available for you to choose from. Visit Buckram Cloth to view your options. Can I navigate through the ODP sections? Yes! There are two ways you can go back and forth between the sections of the On Demand Printing form. On the bottom of the form are buttons that allow you to do this: Previous, Next, and Back to The Last Page. On the top of the form are listed the name of each section you can navigate through. Note: You have to enter information in a section to go directly to it. NOTE: Using the traditional website browser back button or F5 will delete all information entered into the form. What (specific) version of ABLE 6.0 am I running? There are actually two ways you can find this out: on the login screen, the version number is displayed (e.g., ABLE Library 6.01), or by choosing About ABLE from the Help menu, the version number should be displayed in the resulting dialog box (e.g., ABLE Library 6.01). What ports are required to be allowed in our company firewall to access ABLE? If you are having trouble connecting to Houchen Bindery’s ABLE server, you may need your IT department to allow TCP 80 and TCP 9000 to 204.16.90.148. (new IP Nov 3, 2018) The latest version of JAVA is also required for both the MSIE plugin as well as the standalone webstart program. If you are still having trouble connecting please click here to send your computer and network information to our IT staff for assistance. How do I create variable prompts in the title composition screen's title text area (e.g., a title prompt)? Specifying text in the title composition’s title text area as ‘variable’ text in ABLE 6.0 operates much the same as specifying text as, say, BOLD in a word processing program: select the text that you want to be ‘variable’ using the mouse, then click the right mouse button. You should see a pop-up menu, with an item Variable. Selecting Variable will change any currently selected text to be variable indicated by a light blue color, as seen below. Select the variable text using the mouse, and delete the variable using the delete or backspace key. How do I navigate through the title text area (it seems different than ABLE 5.1)? ABLE 6.0 handles navigating the title text area a bit differently than in ABLE 5.1. In 6.0, one enters text in the title text area more like one would enter text in a blank document using a word processing program. In 6.0, you can’t use the cursor keys (like Up or Down) to place the cursor in an empty text area–you first have to strike the enter key till the cursor appears at the line you want to enter text at. But, once you’ve entered these ‘blank’ lines, you can navigate up or down through them using the cursor keys. The same goes for placing the cursor within an empty row. 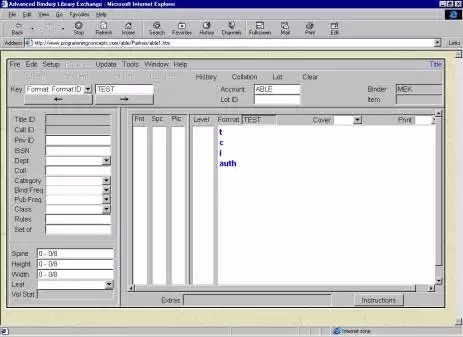 To place the cursor in an empty row, you have to strike the space character until the cursor appears at the (column) position you want to begin entering text at. But again, once you’ve entered these ‘spaces’, you can navigate left or right through them using the cursor keys. How do I search for a list of records (like the F5 key function in ABLE 5.1)? In ABLE 6.0, if you want to be able to do a search to retrieve a list of records, you have to make sure that Enable List Search is selected in the Setup: User Parameters menu. Then, if you enter a key and there is no direct match or there is a direct match with more than one item*, a list will be presented if there are records whose key begins with the key you entered. This list may look like the one shown below. (Remember, though, that this only applies to non-numeric keys like text, private ID, ISSN/ISBN, and call number keys.) *In the initial release, prior to version 6.01, there was a problem with direct matches with more than one item (it would retrieve only the first of the set, not a list). Why is it that after retrieving a record, I can't type into the key field? This behavior was modeled after ABLE 5.1, in which you either had to type F3 (CLEAR) or change the key mode in order to begin entering new key text. So, in ABLE 6.0, to enter a new key, either change the key mode or choose the Clear button. How do I add or delete rows from the Collation window's extras/specials table? when the last column of the last row is highlighted in blue, strike the Enter key (this should also insert a new row). click the right mouse button (which should give you the option to choose Delete from the pop-up menu to delete the row you right-clicked on). Keep in mind, though, that the insertion and deletion of rows is subject to validation rules for extras/specials in title and item records. How come when I choose Alt-Z, the ZLink window doesn't come up? One (simple) possibility is that the catalog system is not enabled. Make sure that Setup: User Parameters: Enable Catalog System is selected (i.e., with a check next to it). (where … is some text). apply the changes, and then restart your machine. Note: We have had some reports where the win command was present in the c:\autoexec.bat file; in particular, occurring before the set CLASSPATH command. Note that the win command is not necessary for Windows 95, 98, or NT, but if you still want to include in this file, make sure it appears after the set CLASSPATH command. I want to connect with a Z39.50 server to import MARC data, but I don't know what information to fill in for a new database in the ZLink window. Pretty Name can be any name that you want to refer to this database as. Host can be the domain name (or IP address) of the Z39.50 server that you want to connect with. Port is the port number used with the host specified, and Database is the name of the database to search over with the host specified. (You also have the option of entering the IP address 140.147.127.13 for Host if you prefer.) The above data was obtained at http://lcweb.loc.gov/z3950/lcserver.html. A good resource for finding other Z39.50 servers to connect with can be found at http://www.indexdata.dk/targettest/targetstat.shtml (this is like an A to Z compilation). Why do I get an error message when trying to connect to a database? Are the Parameters Entered for the Database Correct? Make sure the data you entered when creating the database in the ZLink window is correct. You could try the most recent Library of Congress test server to see if this is the problem (see ZLink Databases). Is the Machine Connected to the Internet? Make sure that you establish an Internet connection before attempting to use ZLink (ZLink will not attempt to make this initial connection for you). You could check that you are ‘online’ by using your web browser to check out a remote web site, e.g., http://www.programmingconcepts.com/able/. Is it a Domain Name Server (DNS) Problem? If you entered a domain name for Host when specifying the database, make sure your DNS isn’t causing problems. You can avoid DNS services by specifying the IP address instead of the domain name (e.g., 140.147.127.13 versus ilssun2.loc.gov). (where hostaddress is the domain name or IP address of the host you’re trying to connect to). If the host is alive and routing is correct, you should see something like the listing below (the result of pinging IP address 140.147.254.1). (where hostaddress is the host you’re trying to connect with, with port number portnumber). If the port number is correct, you should be able to connect (in which case, you can choose Disconnectfrom the Connect menu). Why Still Can’t I Connect? At this point, you should contact us at able_support@programmingconcepts.com! Why is it that when I import MARC data using ZLink, the results I get aren't what I expected? The processing of MARC data goes through several stages before it actually appears in the title composition screen, and it is important to understand the order of these operations. 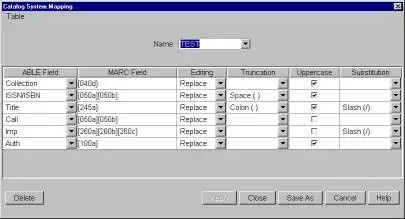 MARC field is placed into ABLE field according to Editing parameter (e.g., Insert); If the MARC field is unavailable, the ABLE field is used as it is. Any truncation is then performed on field resulting from (1). Any uppercase conversion is performed on above result from (2). Any substitution (of spaces) is performed on above result from (3). This gives (4) as the final result. So, depending upon which data is actually imported and how you have your catalog system mapping table set up, you may get results you didn’t expect. A few examples follow below (for insertion editing, truncating on spaces). The MARC field is obtained (if unavailable, an empty string is used). Result from (4) is placed into ABLE field according to Editing parameter (e.g., Insert). The examples now become as shown below (with insertion editing, and truncating on spaces). The actual insertion, modification (or deletion) of bindery parameters (codes using ABLE 5.1 terminology) such as cover or foil colors is a file maintenance feature not yet implemented in ABLE 6.0 (Phase I). In order to perform these operations during Phase I, you need to use ABLE 5.1 file maintenance services. Please remember, though, (as mentioned in the Release Notes), not to run ABLE 5.1 and ABLE 6.0 at the same time! How do I add or delete rows from a mapping table? Can you just show me an example of using the catalog system? Here’s a sample catalog system ‘walk-through’. Create a new mapping table (in Window: File Maintenance: Catalog System Mapping) under the name TEST (this should leave you with 1 blank row). (Remember that new rows can be created by right-clicking and choosing New.) When this is completed, your table should look like the one below. and then click OK, and close the ZLink window. Make sure the table created above is active, by choosing it from Setup: User Parameters: Catalog Table, as shown below. Then, make each of these ‘variables’ by selecting the word, right-clicking, and choosing Variable (they should all be blue, as shown further below). Finally, add this format using Update: Format: Add Format. Now, start with a (clear) title, then specify format TEST (so the t, c, i, and auth variables appear in the title text area). Futures past :, Koselleck, Reinhart. (Note that t, c, i, and auth are still variables in the title text area.) This can be seen below. Where are valid MARC fields that I can use (when creating a mapping table)? A good introduction to MARC records (and the field and subfield codes they may contain) is at http://lcweb.loc.gov/marc/umb/. If you don’t have the patience for that, and just want to see what you can do with the catalog system, see Using the Catalog System. If you’re just looking for other valid codes (e.g., “I’m tired of importing [245a]!” ;), then one source for USMARC Bibliographic codes is at http://lcweb.loc.gov/marc/bibliographic/ecbdhome.html. Why do tooltips appear when the mouse is over a label (e.g., next to a text field), but not when over the text field itself? This is simply by design. Why is it that when I log into ABLE 6.0, another instance of the ABLE Server launches? This is actually the ‘normal’ behavior for the ABLE Server. (On ABLE 6.0 Standalone) one instance should be running before you log into the system, and once you successfully log in, you should notice another instance has been launched. What version of the JVM am I running? If you have IE running, you can choose About Internet Explorer from the Help menu: there should be a full version number displayed, e.g., Version 4.72.3110.8. If the version starts with a 4, you’re running what is commonly just referred to as IE 4, and if starts with a 5, then you’re running what is (similarly) referred to as IE 5. How do I enable the Java Console? 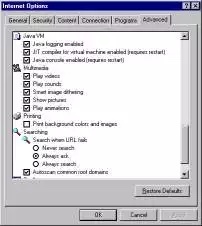 5. make sure Java console enabled (requires restart) is selected; this should look something like the following below. 6. Then, click OK, and restart IE. How do I save text from the Java Console window? It’s not obvious, but you first have to select the text that you want (using the mouse), and then use the Ctl-C key combination to copy the selected text. Then, you can paste this text somewhere where you can save it.